A final product from the recent sub 10 Ironman discussion. Taking what I’ve learnt reviewing my 2007 training diary along with conversation on Tritalk I’ve produced a simple Ironman training week plan. Not a guaranteed route to sub 10 or sub any other time for that matter. I hope they provide an example of and achievable week for working athletes that can progress them to Ironman fitness. The two weeks below represent a minimal approach to Ironman. Training along these lines worked in 2007, but I had frequent weeks above minimal volume or with different structure (races or big weekends. I’ll come back to these later). Were you to repeat this structure until next summer I think you’d be in good shape to race an Ironman. There’s no substitute for work. The more you train well the better your performance will be. There’s a balance when training more compromises quality, particularly of key sessions, then it’s counter-productive. Compromised quality is not hitting the heart rate, power or pace targets or not lasting the duration of a session. What distinguishes front of pack age groupers is not just hours of training, but the capacity to train effectively in those hours. Version one ranges from 10 hours per week to a maximum of 18 depending on how much volume you do in each session. You’ll likely fall into the 12-14 hour mark during the main build of your season. Version two is similar, but attempts to give more free time at the weekend. Many athletes have family as well as work commitments so a rest day at the weekend can be a good option. Both plans schedule an open water swim on the Sunday which would be seasonal and optional. I always recommend some open water practice before racing so ideally there would be a few of these sessions over the summer. Key sessions are in bold. I consider these most important and would encourage you to ensure you complete them each week. There’s room to tweak the plans slightly, but generally I’d advise against stacking key sessions too much. The aim is to come into them able to perform close to your best on the day. 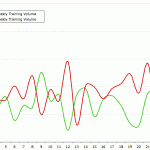 Volume should be varied according to where you are in your season. Over winter I’d not expect endurance rides to be too long in poor conditions. I’d probably suggest viewing them as another opportunity to do a structured session. Keeping it less intense than the threshold bike, but with longer efforts perhaps. I’m not going into detail, but I’ll give an outline of what you want from your key sessions. Swim – one or two key swims a week should involve a good portion of hard work around your threshold pace. The aim is to develop speed in the water. Use the other sessions to emphasise technique and endurance more, but make sure you have hard, measured work in the pool. For any athlete where swimming is a work in progress some kind of technique analysis or coaching is a great idea early in the year. Bike – the endurance ride and a threshold session each week are key. The aim of the endurance ride is a steady pace (not easy) which leaves you finishing tired. It’s not cruising around or soft pedalling, by the end you should be feeling the work you’ve done. The threshold session needs to be a focussed effort including a period of work at threshold heart rate or power. Vary the session, but a simple classic is two 20 minute efforts with 10 minutes in between. Run – the endurance run and a shorter steady run are key. The former I would build to two hours, but find too much fatigue for minimal returns beyond that. Optionally a stronger runner could build to 2.5 hours or alternatively adopt tougher routes and throw in periods above race pace. The second run has faster blocks, but not sprints or speedwork. Time spent above your Ironman race pace is the aim. The key sessions alone will probably do a lot of the work needed to get you fit enough to get round an Ironman, but it’s only with the further training around them that you will really develop the fitness and endurance needed. In isolation they will at least help you towards the goal, but as part of the weekly package they will be major contributors to developing fitness. It’s advisable to go beyond the minimum weekly volume. You can achieve this either by working towards the maximum volume for a session or adding sessions in free periods. Your first choice for an additional session should be in your main limiter – an extra run or bike, maybe a swim (though bike/run has greater potential to impact overall finish time). Remember though you don’t want to add more if it prevents you performing the key parts of the week. Training works through progressively overloading the body to produce adaptations. Working harder in a session can achieve this overload as well as training for longer. For Ironman a mix of both is appropriate. The longer rides and longer runs are essentials for both physical and mental preparation. You don’t need to constantly do six hour rides, but you should at least have a few. The more ambitious your goals the more I’d aim to complete and the stronger I’d aim to ride them. Over the course of the year you’re bound to deviate from the week’s structure. Sometimes it’s an unfortunate consequence of illness or injury. Always prioritise recovery in those circumstances as quicker recovery gives better long term returns. On a more positive note a week or weekend’s training camp or a race will also require adjustments. All three are great ways to push and test progress. Avoid rushing into training camps once you’ve established a decent level of fitness from a month or two of consistent training they’re worth considering. The aim on either of these is to have a large, but temporary increase in training load. This means you’ll take the opportunity to train more and hopefully train harder. Without other distractions you should be able to achieve far more work than normal. Allowing recovery afterwards will see you return fitter than before. 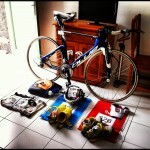 I encourage racing in the build up to an Ironman as it’s a good test of fitness along with a hard training session. Usually I want to minimise taper and recovery periods though so my preference is that you race shorter. Short, sharp events will challenge someone mainly focussed on endurance and generally won’t have too much impact on the program. With minimal taper and recovery the consistency of the week can be maintained. There’s a lot of writing about Ironman training plans on the web so I’ll finish with some recommended reading. Firstly Chuckie V has written on the topic of simple training weeks a number of times. Check out this 12 hour per week program where he goes into far more detail than I have. For those with more time he’s also outlined a longer 18 hour training week in a pair of posts. If you’re thinking of a training week or weekend then Gordo has some superb advice on how to plan these. Hopefully this has given something to consider for those of you looking to race an Ironman in the coming season and not sure of where to start. I know it’s easy to get tied into either too much volume or too much intensity when what’s required for most is a mix of both. Whilst I believe that to really achieve your peak you may need to do more than the minimums presented here or even adopt a different structure a week like this should get you through comfortably.